For the past six-ish weeks, Luke, Levi and I have been working on memorize the book of Philippians. Yes, you read that right….the book. Stacy Farrell at Home School Adventure Co. has created a great system for Bible memorization. If you are up for the challenge of going deep in God’s word, I suggest you put this on your list of Bible tools to consider in the near future. 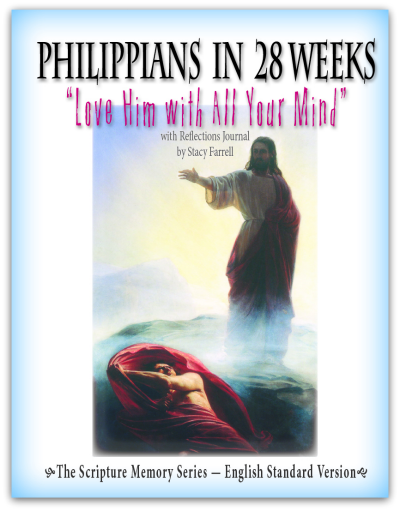 The program is called Philippians in 28 Weeks ($14.95 download; $28.95 print; $9.95 cards only). We received the downloaded version of the program. What is included: Everything that you need (minus a Bible) is included in this 167 page E-book. Chapter-by-Chapter, week-by-week copy work pages, verse cards and log sheets to help you review and recite from memory the entire book! In actuality, you can print off a copy of this book for each of your students, and they will have a workbook to use to help with the Bible memory. A 28-week log for you and your student to catalog each of the four daily steps necessary to complete the program. Each week has a page called "Reflections" which gives you and your students an opportunity to think deeply upon the verses you have been memorizing. Open ended questions can be answered in group study or as a written journal. Read the entire book of Philippians every day. This took us 12 minutes. Quite easy to set aside this amount of time everyday. Record. Each day, write out your verse. I asked Luke and Levi to copy them on whiteboards, one of their favorite ways to complete copy work. Some days, I asked them to complete a fill-in-the-blank worksheet I made for them; still other days, I asked them to write it on paper. White boarding (did I just make up that word?) their verses (with various colors) was definitely the preferred method for daily copy work. Another way of recording your newly learned verses is to answer questions and journal what you have learned. Repeat. There are business-card sized verse cards you can carry with you. Review and Recite. At the end of each week, you recite all that you’ve learned from the beginning. Retain. Then, at the start of the week, you review all you’ve memorized. How This Worked for Us: The product is designed for ages 9-11 as a read aloud with parents, and for ages 12 and up to use independently. Originally, I thought Ben would have time in his day to work on this, but he was up to his eyeballs in other stuff, so I gave him a pass. Luke (11) and Levi (8 ) were my test subjects instead. It seemed an easy and natural activity to build into our day, considering the other curriculum activities that we use rely heavily on memorization. My goal was to start our day with a reading of Philippians, which is one of my favorite books of the Bible. I was really surprised at how fast it takes to read it – we were done in 12 minutes or so. How many days do I waste 12 minutes when I could be doing something so valuable? In all honesty, it was humbling to see how simple it is to incorporate this program into our family. Next, I turned the boys attention to the verse for the day. OK, just so you know – I really adapted this to meet our family’s needs and season of life. But, I’m hopeful that you can see that this product is a tool that you can use to accomplish the same goal that Stacy Farrell had – to hide God’s Word in the hearts of her family. There is no condemnation for taking longer than 28 weeks to memorize an entire book of the Bible! I will admit that one part that I inadvertently omitted during this review period was the reflection component of the program. I totally forgot to print out the “Reflections” worksheets and journaling pages for each week’s set of verses. I’m not sure the free responses pages would have been worth it for the age of my boys, but I do think think that there is value in going over some of the more easily answered “Reflections” questions in the book. I love that these moments can provide some closer and cohesiveness to the memorization process. I also want to add my personal thoughts on reading the book of Philippians on a daily basis over the course of several weeks. Reading the same book over and over is a soothing balm to the soul. It is amazing to me God’s love just leapt off the pages and totally transformed my outlook for the day. Each day, a different truth was tucked into my heart. This has been a lovely lesson for this mama to learn over these weeks. 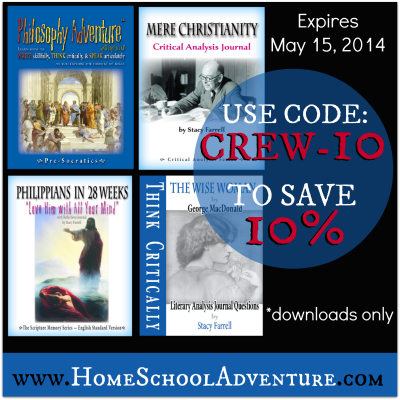 My Thoughts and Recommendations: This has been a wonderfully different way of incorporating Bible into our home school – but I certainly do not think this product is valuable for home school parents only. I think any Christian family can utilize this program, and I would love to get to a point in our family’s scheduling where we could use this together as a devotional (indeed, there were some nights we did read the entire book of Philippians as a devotional). Click the link below to see these other amazing products. Homeschool Adventure Co. is offering a discount to my readers for any of their products that my Crew Mates and I reviewed! Just use code CREW-10 and take 10% off your downloaded product! This sounds really neat. I reviewed a different product, but I am thinking about purchasing this one, because Philippians is one of my favorite books! "My goal was to start our day with a reading of Philippians, which is one of my favorite books of the Bible. I was really surprised at how fast it takes to read it – we were done in 12 minutes or so. How many days do I waste 12 minutes when I could be doing something so valuable? In all honesty, it was humbling to see how simple it is to incorporate this program into our family." Also, I enjoyed seeing your marker boards. What a lovely and creative way to help your children etch His Word upon their hearts. Well done!